In the late 1400s, South Africa was visited by Vasco De Gama, a Portuguese sailor who relied solely on primitive instruments to find his way. He didn’t even have a sextant, which wasn’t invented yet. He used something called a nocturlabium, also known as a star clock, in conjunction with the only map he had: the starry sky. Da Gama’s goal was to find the coast of India, thereby becoming the first European seafarer to find a southern seaway to this exotic trade partner. On his way, he sailed around the Cape of Good Hope before reaching India six months later in 1498. Da Gama was, in essence, the first European to reach terra incognita of the east. Montblanc’s watch division was motivated by the navigator’s inspirational tale of pioneering spirit and has now created a collection of special edition watches accompanying the new Heritage Chronométrie line, some of which is in da Gama’s honor. Let’s begin with my personal favorite of this new slew of watches from the refreshed brand: the reinterpreted ExoTourbillon, a complicated timepiece originally introduced in 2010. As the name already suggests, the Heritage Chronométrie ExoTourbillon Minute Chronograph contains a monopusher column wheel chronograph. This is Montblanc’s own chronograph caliber, which is in use in all the Rieussec models and is powered by twin spring barrels. The barrels are recognizable on the dial in the shape of two semicircular counters with sectoral scales for counting seconds and minutes. The ExoTourbillon Minute Chronograph also contains a patented hacking tourbillon, whose technical design differs from A. Lange & Söhne’s hacking tourbillon (these are the only two I know of) in that Montblanc’s is accomplished via a spring. 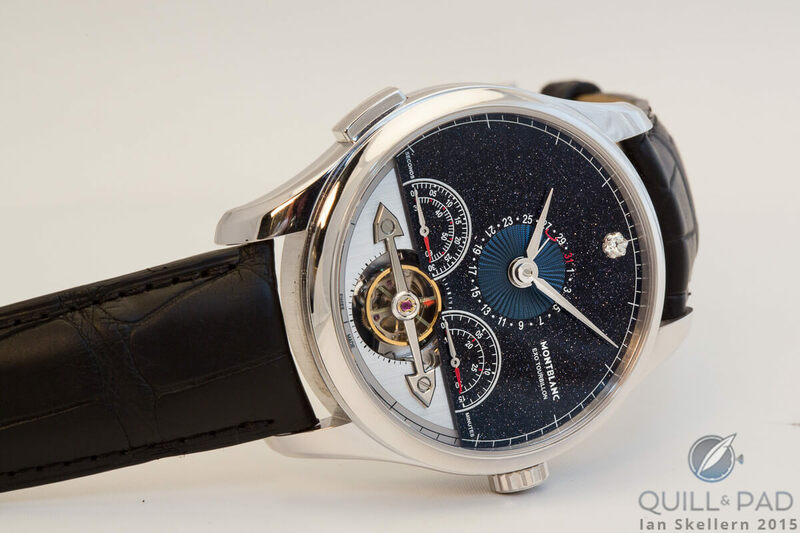 It is outfitted with a vertical clutch and a large screw balance, which is, in fact, larger than the tourbillon cage. This is possible by means of the exo design (exo means “external” in Latin), which separates the two, moving the rotating carriage to a separate, higher plane on a two-point bearing. The movement has been completely reworked for both extreme reliability and cost-effectiveness. Automatic Caliber MB R230 is now based on the automatic Sellita SW 300 movement and reengineered to keep the height down. The attractive visuals of this 44 x 14.79 mm red gold case differentiates it from the Rieussec models, and the added comfort of a rapid-reset hour and date both backward and forward makes it a perfect travel companion. Almost inexplicably competitive, this timepiece retails for € 38,000*. And here’s another interesting tidbit: the black alligator-skin strap was made at Montblanc’s own “pelletteria” (leather maker) in Florence. Makes you wonder why they haven’t been doing this all along. If there was any way to increase the “boom” effect of the Heritage Chronométrie ExoTourbillon Minute Chronograph, it was to style it like this. Strictly limited to just 60 examples, the limited Vasco da Gama version contains a few incredible visual differences: above all, the upper part of the dial is adorned with a slice of aventurine, which is one of my personal favorite ways to jazz up a timepiece. The dark, dark blue of the aventurine with its sparkly speckles emulates a starry sky. Additionally, a diamond cut in Montblanc’s patented Montblanc-cut (which mimics the Montblanc star) lights up the 12 o’clock position. A flinqué guilloche embellishes the center of the aventurine dial where the date display is found, symbolizing the nocturlabium according to Montblanc. On the same Montblanc-made alligator-skin strap, this special limited edition retails for € 45,000*. “We have to create surprise and enthusiasm for the customer,” said Jens Koch, executive vice president of marketing and product design at Montblanc. And, yes, they have achieved that with this model, at least for me. But Montblanc hasn’t stopped there. The brand also releases both an annual calendar and a complete calendar in the limited edition Vasco da Gama subset. The automatic Heritage Chronométrie Quantième Annuel Vasco da Gama, which knows all the lengths of each month automatically save February, which must be manually corrected, uses subdials to display its calendar functions. A beautiful lacquered moon phase display complete with starry sky including a depiction of the Southern Cross at the 6 o’clock position differentiates the Vasco da Gama edition from the regular collection model. Housed in a stainless steel (€6,100*) or red gold (€10,650*) 40 x 9.55 mm case, they are limited to 316 and 238 pieces respectively. The number 316 refers to the number of days it took da Gama to travel from Lisbon to India, while 238 is the height in meters of South Africa’s Cape Point. The Heritage Chronométrie Quantième Complet Vasco da Gama full calendar, whose dial is dominated by classic window displays for the day and month, needs manual help from its owner at the end of all months without 31 days. The date is shown by a classic hand extending from the center that points to the respective number found in a scale encircling the dial. This automatic timepiece is available in a 40 x 9.7 mm stainless steel case and retails for €4,350* on a Montblanc strap. The non-limited edition is available for €4,250* on a strap and €4,510* stainless steel bracelet. Following on the classic looks of last year’s Meisterstück Heritage collection, the Heritage Chronométrie Dual Time continues the ultra-classic styling now associated with this brand’s Heritage line. The 41 x 9.9 mm timepiece is powered by automatic Caliber MB 29.19, which contains an in-house-developed module to display two time zones via the crown. There are no fussy correctors. The second hour hand can also be set so that it completely covers the first hour hand, thereby showing only one time zone. It is available in stainless steel on an alligator skin strap (€3,990) or stainless steel bracelet (€4,250) and in two-tone stainless steel and rose gold (€5,490)*. Other new releases include the Metamorphosis II, the Timewalker Urban Speed Chronograph (€4,200), and the world time Meisterstück Heritage Orbis Terrarum (€4,990 in stainless steel; approx. €11,000 in red gold). * All prices mentioned in this article are German euro prices including VAT.